In the heart of Tuscany, immersed in the gorgeous Tuscan country side of the famous Brunello's wine region, lies an important eno-tourist centre, Castello Banfi. The fortress is situated on a hill overlooking the surrounding land where high-quality vines are grown, great expanses that give birth to excellent productions such as the famous Brunello di Montalcino. Montalcino is 20 km away and other important cities in the area are Siena and Florence respectively at 70 km and 130 km, both north of the estate. The hotel Castello Banfi il Borgo, at the centre of a domain of 2830 hectares, is a stone village that was built around 1700 next to the towering castle, formerly called "Poggio alle Mura". The stone houses of the Village were built outside the walls, but not too far away from them, when it was safe enough to move from those without, however, stray too far. The medieval fortress, now known as the Castello Banfi, is used as a reception centre of the wine estate that bears the same name. 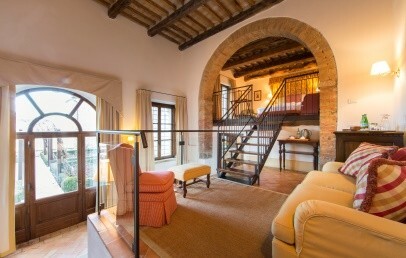 The exteriors of the structure, even after the renovation, have maintained the original form of a typical building of the XII century, but the interiors are certainly a pleasant surprise: elegantly furnished, spacious, airy and enriched with every comfort. 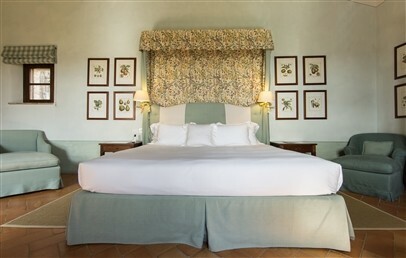 The special attention that guests receive from all the staff of the Castello Banfi, makes the holiday in this enchanting place unique. You will only have one regret: that the holiday will last too short! 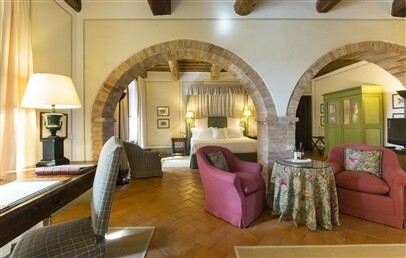 The 14 luxury accommodations of the Castello Banfi – Il Borgo divided into rooms, Junior Suite and Suites. Each varies in size, location and furnishings. The common denominator is the class that can be found in the choice of furnishings and fabrics used, all in perfect Tuscan style. The famous architect Frederick Forquet has finely restored and decorated this space with exposed wooden beams, arches covered in stone and terracotta floors. In the spacious bedrooms and bathrooms we find comfortable king-size bed, large walk-in rainfall shower or bathtub. The suites have, in addition to a king-size bed, a sofa bed placed in a separate room. Some rooms have the possibility to offer two single beds. All are equipped with the modern comforts such as flat screen TV with international channels, Pay-per-view TV, Wi-Fi internet connection, safe, Nespresso coffee machine and complimentari minibar. Upon arrival, the mini bar in the rooms and suites will be equipped with a complimentary selection of wines from Banfi Estate. The Castello Banfi offers two restaurants “La Taverna” and “La Sala dei Grappoli”, both a real treat. “La Taverna” is open for lunch and housed in the old wine cellar, where once rested the large wooden barrels of the “Brunello di Montalcino”. The cuisine is characterized by Tuscan and local tradition, prepared with seasonal ingredients. Guests can choose from the à la carte menu or taste a degustation menu. The restaurant “La Sala dei Grappoli” is open for dinner and invites their guests in an elegant and upscale ambience. During the summer months, with nice weather, the delicacies are served on the outdoor terrace, in order to better enjoy the scent and taste of the dishes surrounded by the silence of the Tuscan countryside. Of course, the delicious plates will be accompanied by excellent vines from the own production. The Castello Banfi offers its customers a beautiful outdoor heated swimming pool overlooking the valley and the mountains that surrounds the property. For those who seek peace and tranquillity and love to contemplate the surrounding nature, perhaps sipping a glass of wine, the pergola located in the garden turns out to be just perfect. In the estate, if you wish, you can also attend cooking classes and wine tasting sessions in order to better assimilate the secrets of the Tuscan cuisine and how to match them with excellent wines. Among the activities of Castello Banfi we cannot forget to quote the first and foremost related to this area: the production of wine. Of course, being this company one of the best known in the world in this field, guests can approach this universe through guided tours of the cellars and wine tasting. Moreover, the Banfi winery, converted from old buildings of the property, offers the opportunity to taste and buy wines but also grappa, extra virgin olive oil, honey, pasta and typical desserts. For those who want to deepen their knowledge, books that relate to wine, gastronomy, history and architecture of Tuscany are also available. It is worth noting that, besides the Enoteca, the Banfi estate has a Balsameria where the Salsa Etrusca evolves, a concentrated nectar more refined than balsamic vinegar, which is left aging in small barrels made from fine woods and is obtained from late harvested grapes. Besides these two important activities, there is another one for which the Banfi founder, John F. Mariani, has spent considerable time: it is the most important private collection of Roman glassware in the world displayed here in the museum of glass. The collection includes testimonies from Roman times, some pieces are even dated around the fifth century BC. This is an initiative that has to do with art but also with another type of culture, that of wine. Glass and wine have always been tied and here at the glass museum we have ample evidence of it. The municipality requires the payment of a tourist tax of € 5,00 per adult, per day. Large bedroom with a double bed of 200x200 cm. 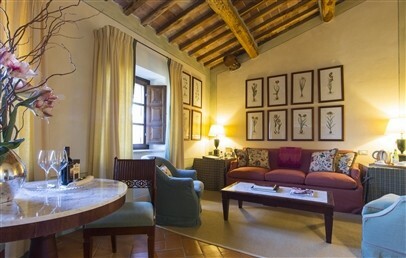 It is furnished in the typical Tuscany style: large wardrobe with drawers, traditional fabrics, exposed wood beams, arches covered in stone and terracotta floors. 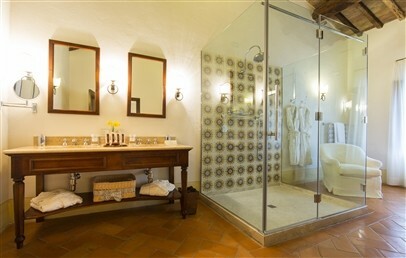 The private bathroom has a walk-in rain fall shower, bathrobe and hairdryer. 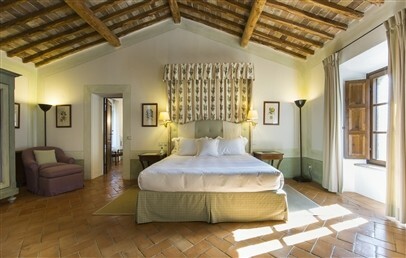 All rooms overlook the countryside surrounding the castle. 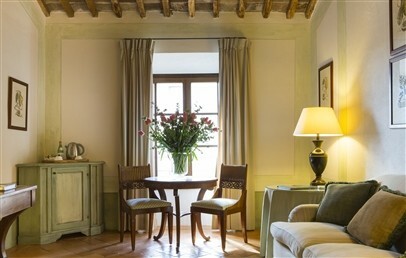 Large suite with 200x200 cm bed and living corner furnished in the typical Tuscany style: large wardrobe with drawers, traditional fabrics, exposed wood beams, arches covered in stone and terracotta floors. 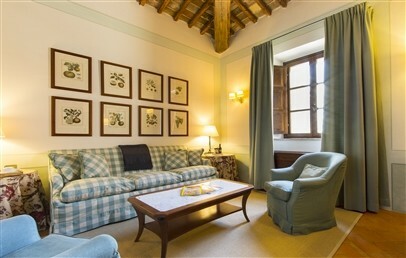 The Riserva Suite has a cozy and separated living room with sofa bed and two private bathroom with walk-in rain fall shower, bathrobe and hairdryer. 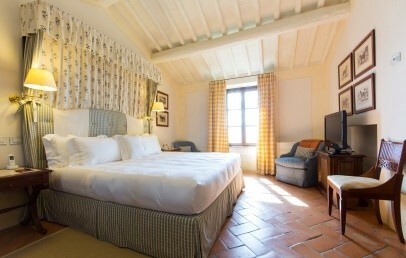 All rooms overlook the countryside surrounding the castle. 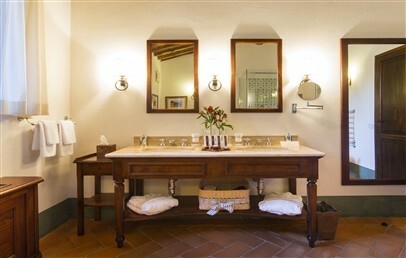 Large suite furnished in the typical Tuscany style: large wardrobe with drawers, traditional fabrics, exposed wood beams, arches covered in stone and terracotta floors. The Classic Suite has a cozy living room with a sofa bed. The private bathroom has a walk-in rain fall shower, bathrobe and hairdryer. All rooms overlook the countryside surrounding the castle. 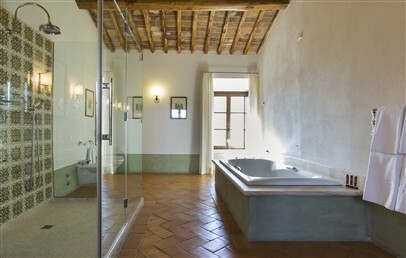 Refined and exclusive Suite with 200x200 cm bed, comfortable living area, big wardrobe and dresser in Tuscan style and bathroom with walk-in rain fall shower and separated bathtub. 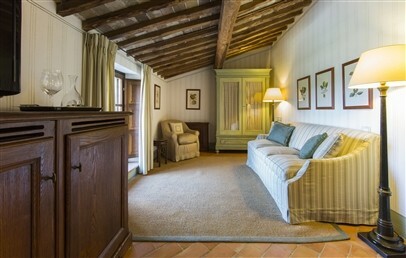 The Poggio dell’Oro Suite consists also of a separated living room with sofa-bed and a second bathroom (with direct access to the living room) with walk-in rain fall shower, bathrobe and hairdryer. 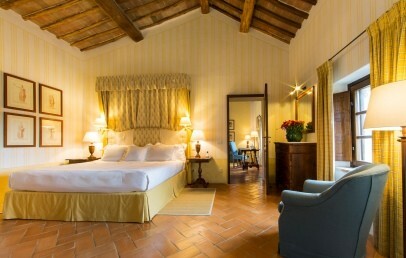 This unique Suite has moreover a private selection of prestigious wines, some of them are rare vintages of the collection of the "Poggio all'Oro Riserva". 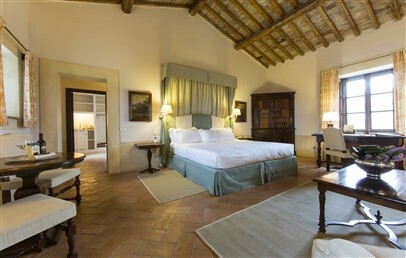 A spacious bedroom with a wardrobe and dresser in Tuscan style and a comfortable sitting area with a sofa bed. The bathroom has a walk-in rain-fall shower, bathrobe and hairdryer. All rooms overlook the countryside surrounding the castle.